The video games industry is huge: nowadays game releases are making more money than the movie industry. There have always been a huge number of video game related websites online – There are websites for Gaming News, Video Game Reviews, Downloads and Add-ons for games, YouTube Streamers and Twitch Lets Plays, Cheat Codes, Websites to play games online, website FAQs and Wikis dedicated to single games – you name it and there will be a website about your favorite game. If you wish to create your own gaming website, it has never been easier for you to do so. By choosing WordPress as a CMS you have a sold foundation for creating just about any type of website. It’s perfect for content-based sites as you can easily add pages and blog posts with commenting facility built-in. You can then extend it with a number of plugins, such as social media, galleries and sliders which will all help to increase interaction on your site by your guests. WordPress is free to download, then you will need a good hosting company which can be fairly cheap – you can always upgrade to managed hosting later on if your site takes off. 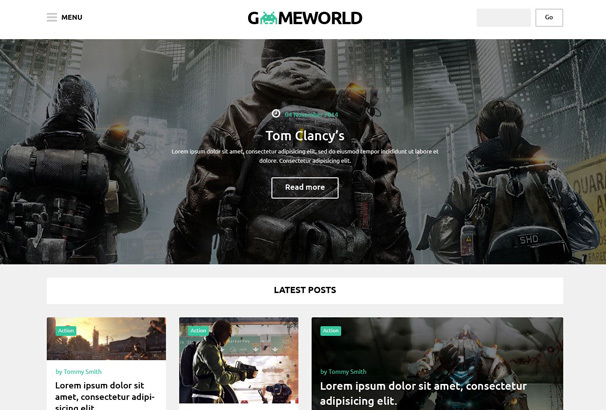 If you would like to create you own Video Games website and share your passion online then our WordPress Gaming Themes roundup is for you. 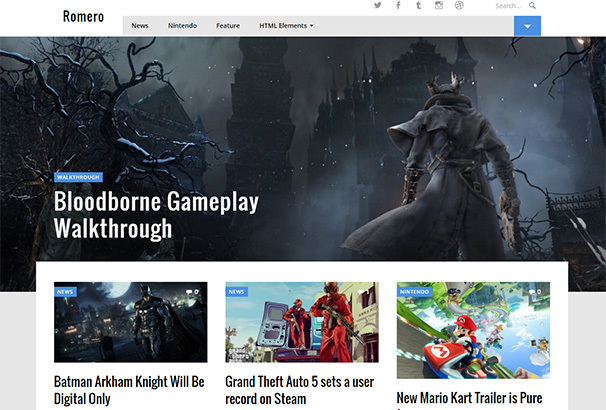 All these themes are well-designed and coded and aimed at the gamers niche, you can show off your videos, news, reviews and other video game information using these WordPress themes. 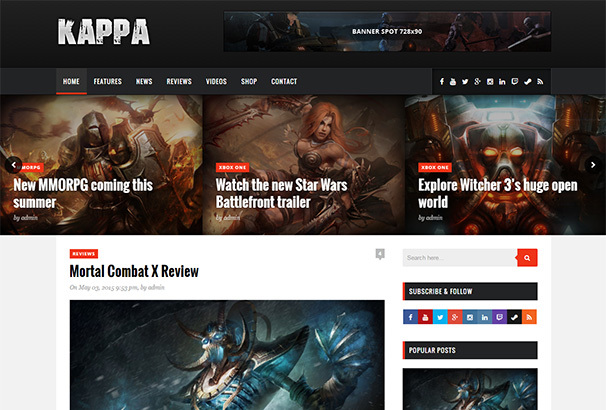 Extra is a quality theme by WordPress perfect for use with every kind of video gaming site including video game review sites and portals, tutorial sites and more. Integrated with Divi Builder technology, this great theme allows you to create and manage your website layouts more simply and easily than ever by just dragging and dropping content. 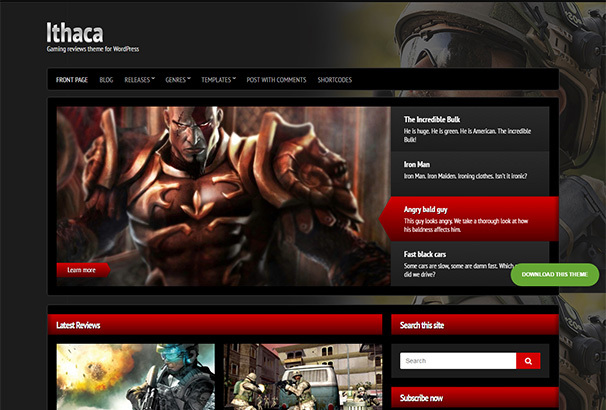 This multi featured theme by WordPress is suitable for all types of gaming related sites. Giving you the freedom to add multimedia to your site in for form of videos, create playlists and more, the homepage is arranged in a grid structure and offers a choice of 4 different homepage templates. 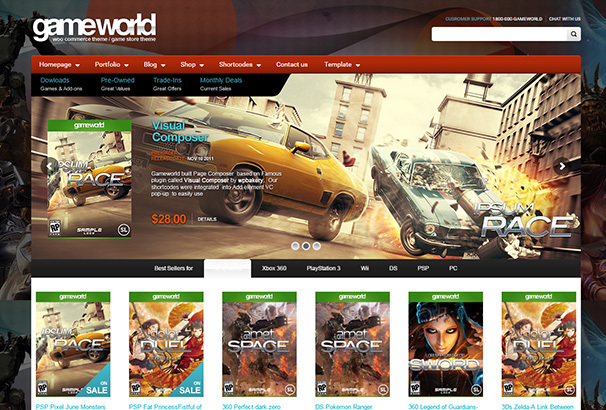 Gameworld is a portal WordPress theme designed especially for gaming websites. Powered by Cherry framework it is very easy to setup and customize to your needs. It boasts a large header for showing off your latest posts as well as multiple galleries. 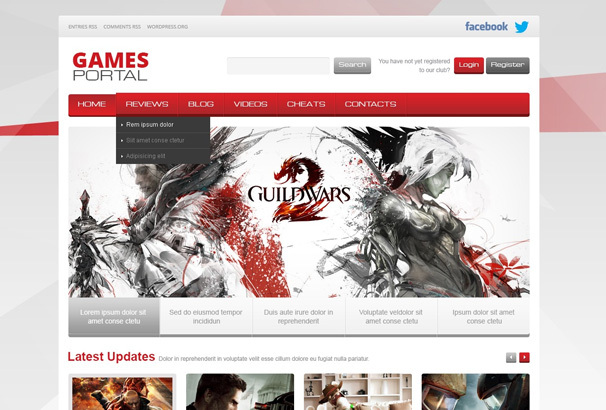 Make sure everyone has a slice of the action with the help of this high quality gaming theme from WordPress. With many great features as standard, this fantastic theme is fully responsive and will display brilliantly on each and every device. 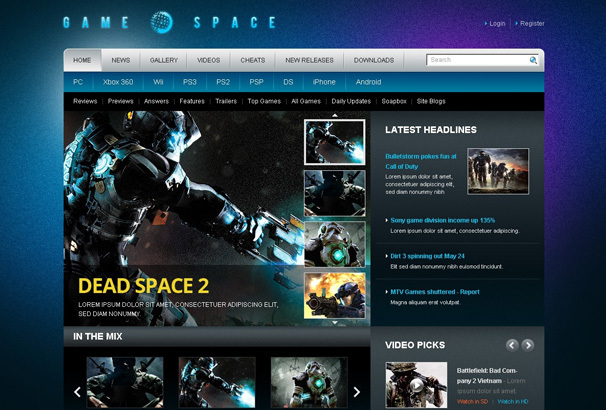 Game space is a visually stunning magazine style theme from WordPress. Its bold design and amazing selection of built in features are sure to make a real impact online. 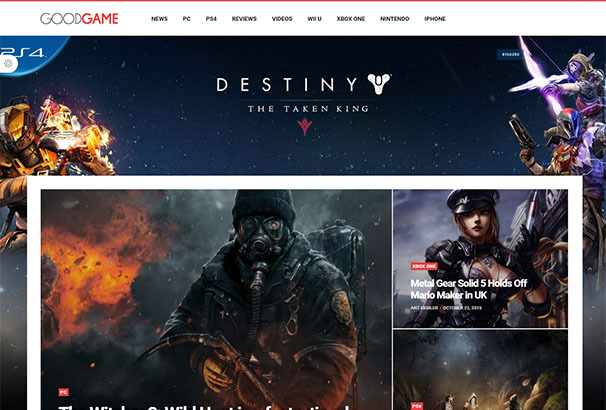 SEO optimized, retina ready and fully responsive, this theme has the full package to assure your new gaming site’s success. 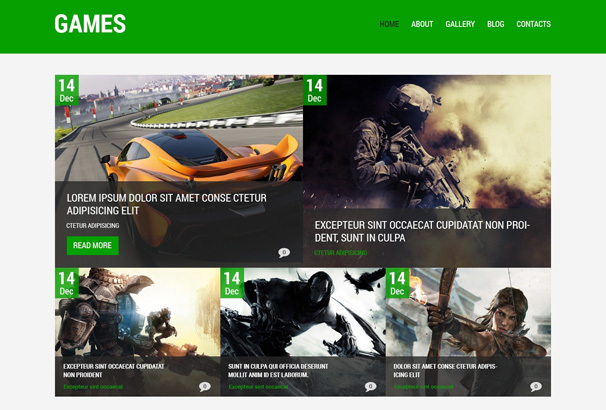 Guage is a Magazine style WordPress theme designed for review websites which gives you the power to complete video games portals for single or multiple games. 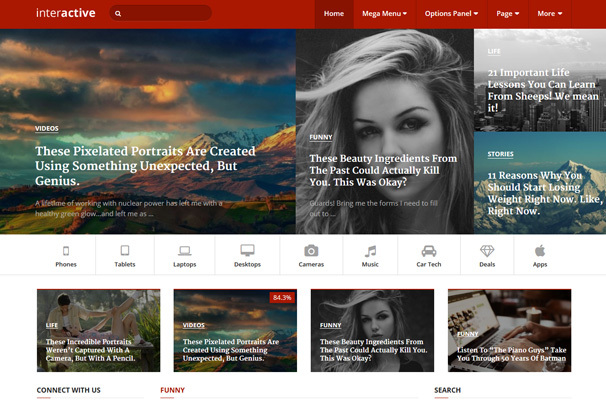 This high quality theme’s contemporary design is sure to make a real impact. 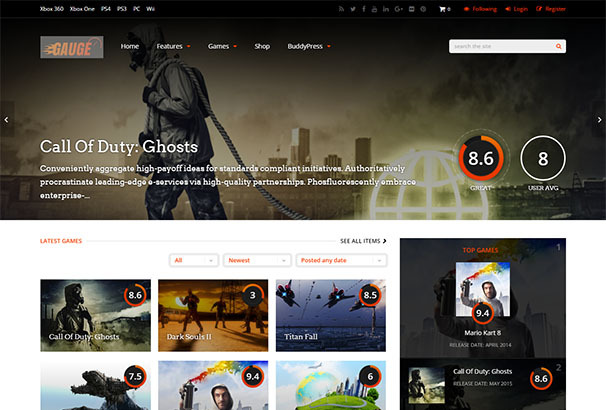 This premium WordPress theme enables you to create gaming reviews or tutorials with absolute ease. Its clean and bold layout and understated design elements will highlight your content to its very best advantage. 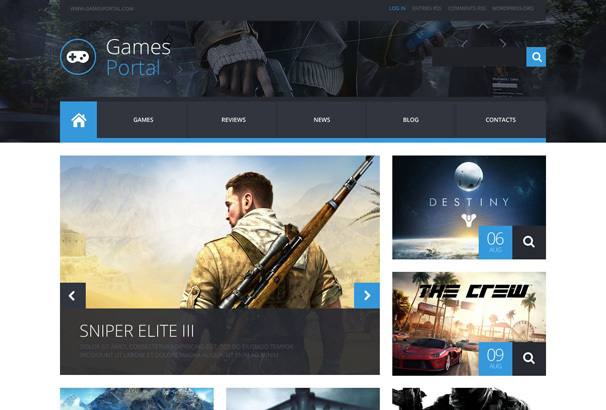 Game Portal boasts a dark layout with a large header on the homepage to display your latest or featured content in real style. Allow users to view your latest posts and integrate your site with social media when you choose this quality WordPress theme. 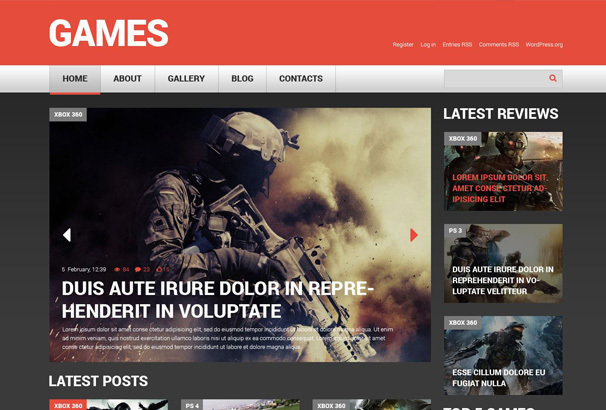 Games is a responsive magazine style WordPress theme for gaming reviews, gaming news and other video game related content. 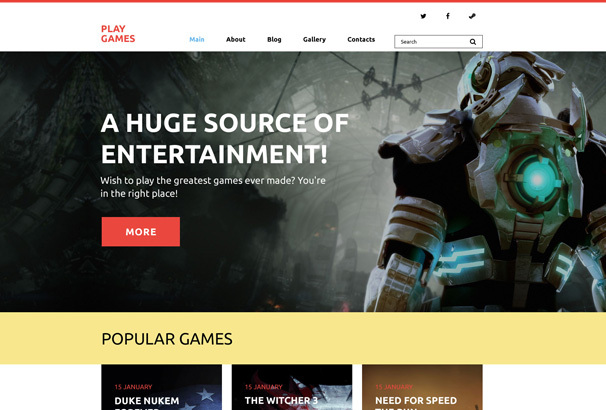 Featuring a bold green header and accent colors and a grid style layout on the homepage, this has all the tools you need in order to start creating your best ever gaming site. Interactive is an eye-catching and highly professional magazine or blog theme that is perfect for gaming webmasters who want to really engage with their audience and maximise their readership. Display multiple post categories and large featured images on the homepage when you choose this amazing WordPress theme. 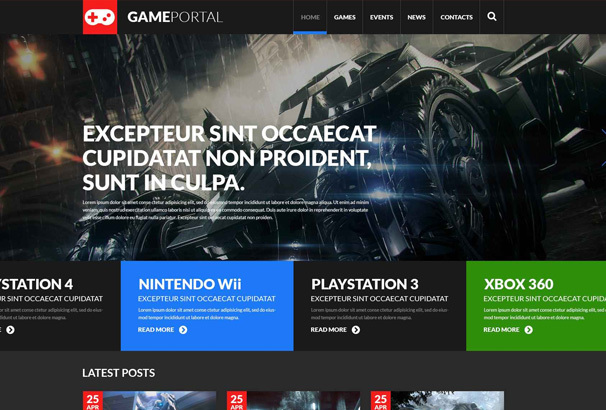 Games Portal is a complete games portal WordPress theme which enables your users to register and login to comment on articles and rate posts. Fully integrated with social media, its strong typography and powerful design add to its appeal. 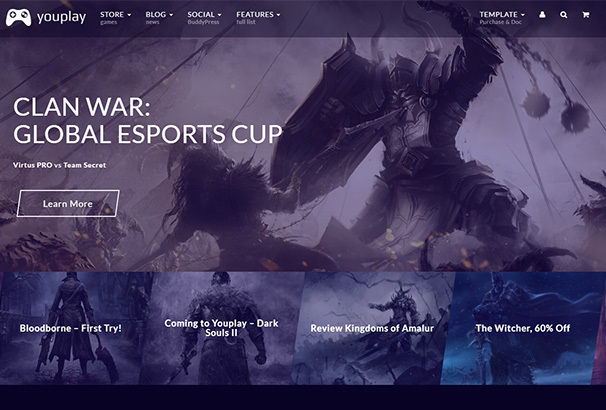 Developed for gaming websites, this stunning theme by WordPress boasts many amazing features including a built in header slider to display your newest games to their fullest effect. Gamers all over the globe will appreciate your new site’s impressive imagery and easy to navigate nature. Strong and modern design elements combine with a host of amazing built in features in this premium quality theme by WordPress. SEO optimized and fully responsive, it will make a real visual impact regardless of the device on which it is viewed. 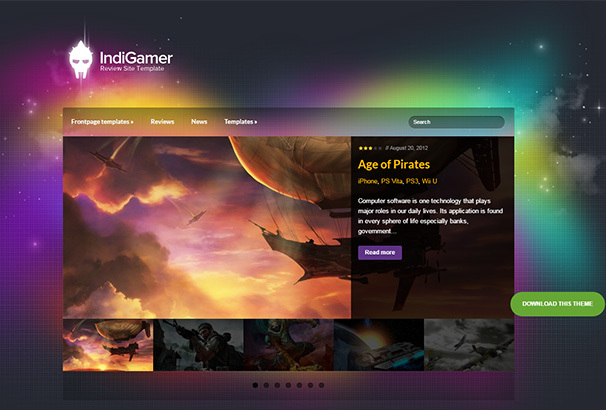 The futuristic design of this amazing WordPress theme will appeal to gamers of all descriptions. Upload content quickly and easily and thrill your readership with the help of this premium quality theme which has been crafted specifically with gamers in mind. 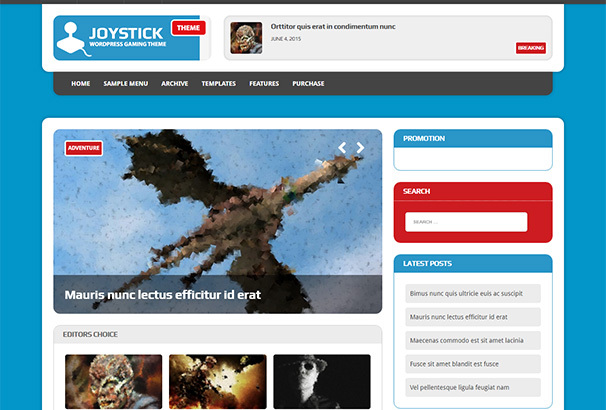 MH Joystick is a fully responsive, attractive and SEO optimized magazine WordPress theme that comes with great features, customizable options and awesome custom widgets to create stunning and effective online magazines and dynamic news websites about games, entertainment, technology and more. 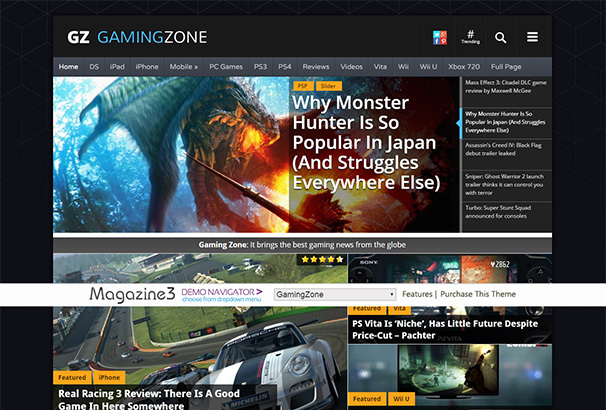 GamingZone is a WordPress magazine theme for gaming portals, gaming news websites and more. Understated and sleek in design, this theme will allow you to highlight your content and videos to their maximum potential and to increase your readership in the process. 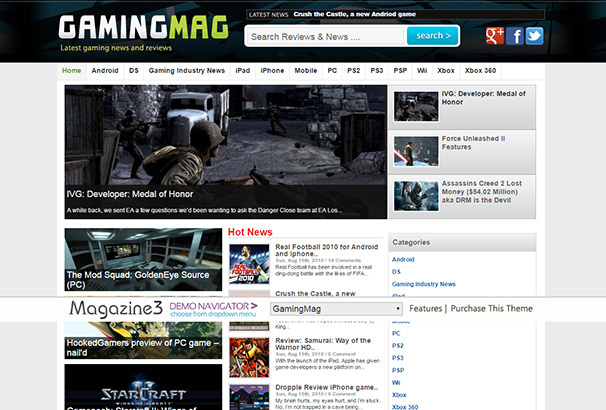 GamingMag is minimal yet elegant WordPress Gaming magazine theme with an advanced built in options panel. A perfect theme for gaming portals and gaming blogs, this has all the tools you need to bring your online presence to the next level. The vibrant imagery of Romero make it an ideal theme for video game sites, car magazines, and other sites where images need to make an impact.Fully responsive, this will look great on both PCs and iphones. 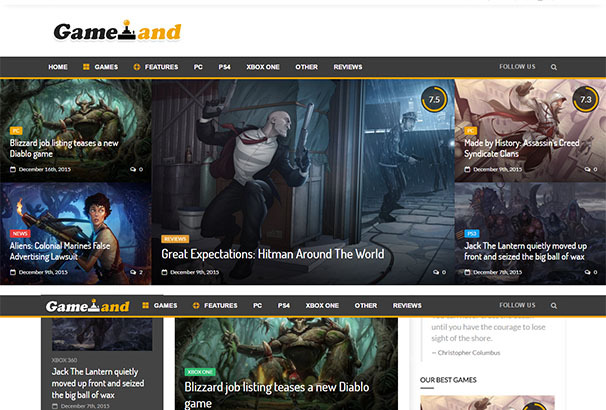 Designed with video game blogs in mind, however, this great theme can be adapted to any niche. Boasting many advanced features including a custom author review system, video embedding (from video sites such as YouTube), thumbnail resizing, and more, eGamer also gives users full control over many of its functions. 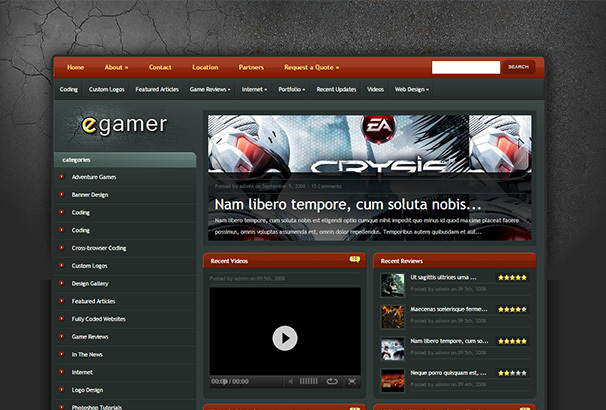 Youplay is a creative and responsive theme for gaming related sites. 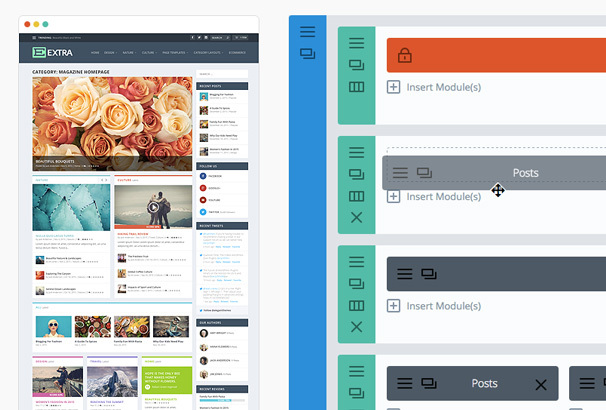 An awesome integrated visual composer and super powerful admin options panel combine to make this quality WordPress theme a real force to be reckoned with. This theme is packed with great features and admin options enabling you to add and filter reviews and much more! 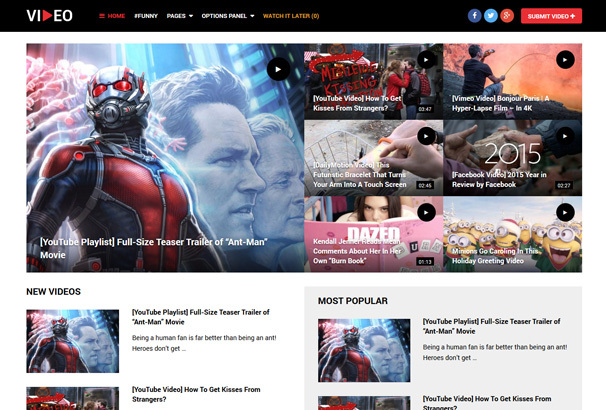 This super stylish site can be the perfect backdrop for all of your gaming related content. 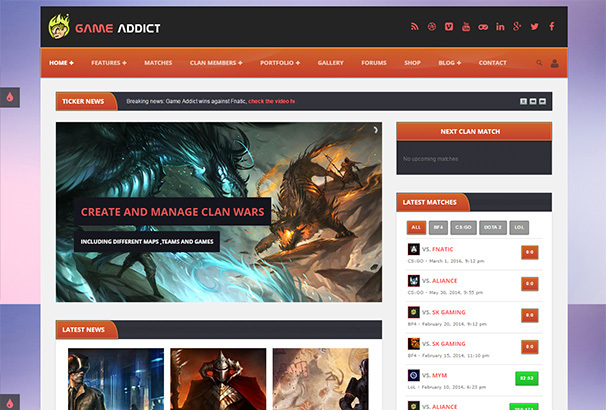 Game Addict is a modern and effective WordPress theme which enables you to easily create and manage clan wars involving different maps, teams and games. This theme’s bold design will appeal to gamers everywhere. Kappa is a premium gaming theme designed to empower you to share your passion for gaming with the wider gaming community. Its strong imagery and ultra contemporary layout make for a really visually compelling site. 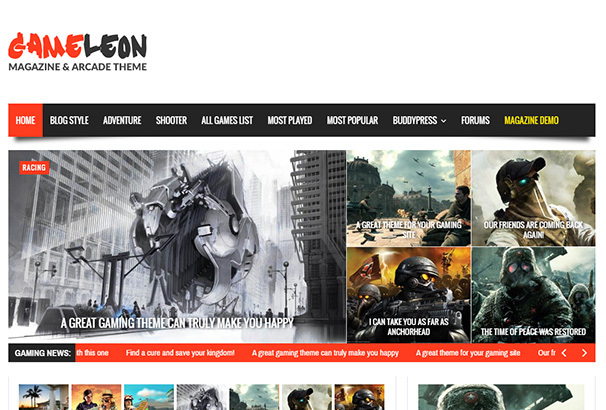 Gameleon is a WordPress theme for online gaming and game review sites in particular. Beautifully simple in design, its complete range of fully flexible features allow you to craft a site that is truly and uniquely yours. 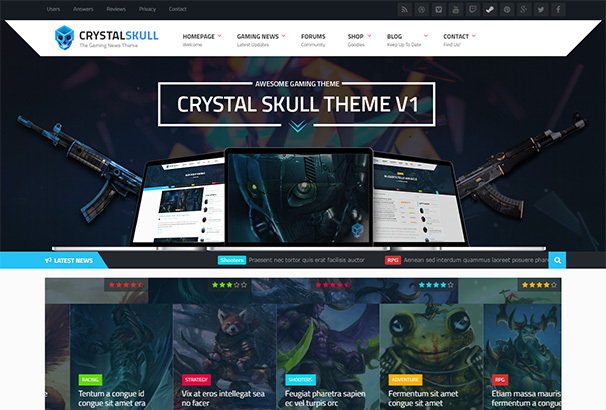 CrystalSkull is a quality gaming news theme from WordPress. Fully responsive, it will be visually stunning on all devices. 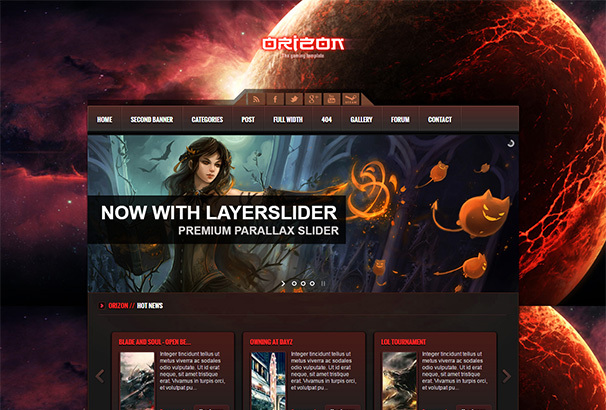 Orizon is a theme for gaming, news and entertainment content. Created using the latest CSS3, it allows you to create a sleek and eye-catching online magazine, blog, gaming or personal project site with greater ease than ever before. Gameworld works alongside the free WooCommerce plugin to allow you to create an online store for gaming products such as physical games, digital download keys, gaming peripherals, consoles and PCs. Why not take advantage of this great added bonus from this fully featured WordPress theme. 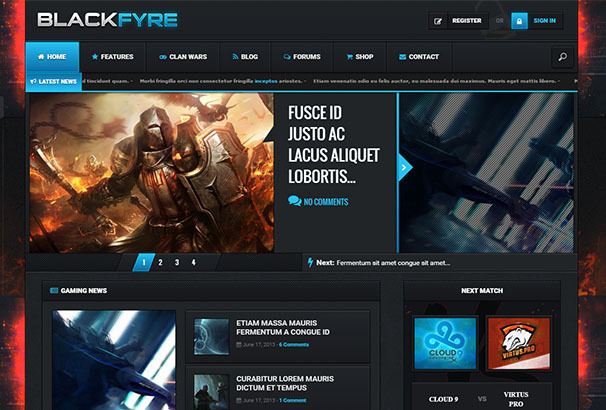 Blackfyre gives you the power to create massive gaming communities with just a few clicks of your mouse. Its modern and bold design and great features as standard make this a super appealing WordPress theme. Boasting a mind blowing full screen video, this gaming theme comes with many integrated and flexible features as standard. 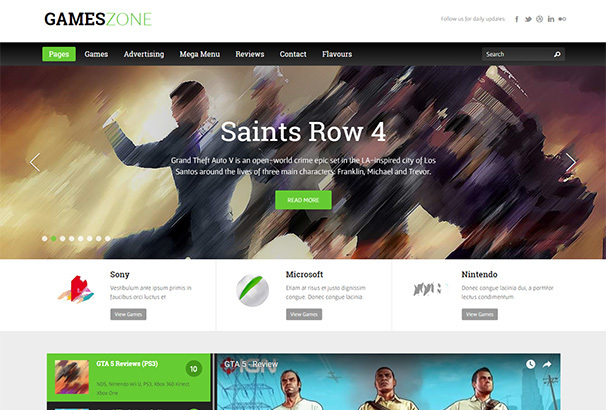 Unlock your gaming site’s full potential with the help of this quality theme. NewsGamer is a professional responsive WordPress template suitable for gaming magazines, newspaper publishers, magazine or advanced blogs. Streamlined and minimal in design, this has all you need to build a superior new gaming site quickly and easily. Thank you for sharing. You should try out last day on earth mod apk in your android phone once.